As we mentioned recently Andy Billingham went to the Hannover Exhibition where he spent an interesting few days on the EMKA stand performing a vital role as the UK interface with various corporate departments on behalf of all our UK customers – we understand Andy even managed to speak to some keen UK engineers who also made the trip to this flagship international technical exhibition. The New 1325 swinghandle – see below – was very successfully launched with much interest from all sectors of industry – especially valuing the facility to interchange lock modules at any stage of the cabinet life cycle. Please ask your local sales engineer to see a sample – or contact our telesales staff for further information. 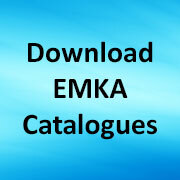 Many new brochures were unveiled at Hannover, especially the EMKA ECHO – our new product review manual now available in English online and soon in hard copy. Also, eagerly expected are English versions of a new Commercial Vehicles catalogue, a new Electronics catalogue and a catalogue detailing custom Production capabilities. All round an excellent show where the simple open stand design greatly facilitated viewing of new products at the front, with ready access to established items further on the stand where in-depth consultation with EMKA sales engineers was possible. Share the post "EMKA at Hannover Messe – Review"